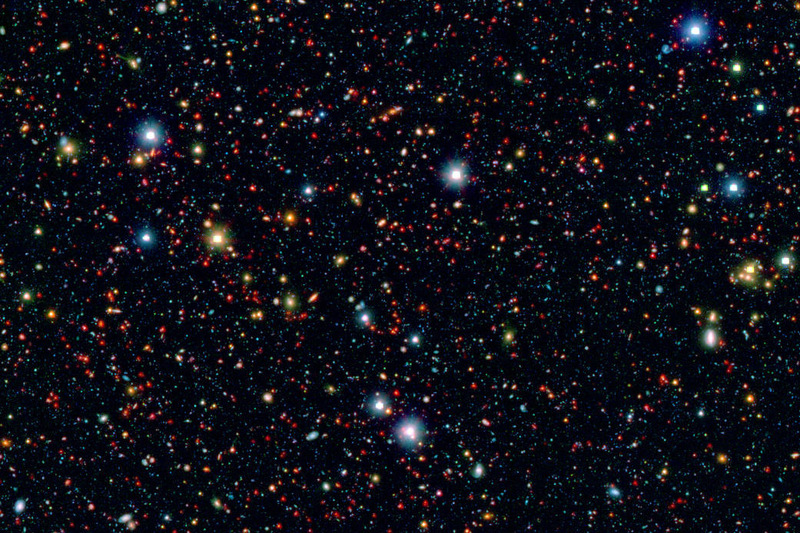 Millions of galaxies populate the patch of sky known as the COSMOS field, short for Cosmic Evolution Survey, a portion of which is shown here. Even the smallest dots in this image are galaxies, some up to 12 billion light-years away. The square region in the center of bright objects is where the telescope was blinded by bright light. However, even these brightest objects in the field are more than ten thousand times fainter than what you can see with the naked eye. The picture is a combination of infrared data from Spitzer (red) and visible-light data (blue and green) from Japan's Subaru telescope atop Mauna Kea in Hawaii. These data were taken as part of the SPLASH (Spitzer large area survey with Hyper-Suprime-Cam) project. Rochester Institute of Technology’s Jeyhan Kartaltepe is assuming leadership of a team of more than 200 scientists worldwide collaborating to study how galaxies are influenced by both their fundamental physical properties and the environment that surrounds them. Kartaltepe, an assistant professor of physics and deputy director of the Laboratory for Multiwavelength Astrophysics, became one of three faculty appointed to the Cosmic Evolution Survey (COSMOS) leadership team in January. The COSMOS collaboration uses most of the world’s major telescopes on the Earth and in space to study a large patch of sky about 16 times the size of the full moon. The researchers examine all the different wavelengths of light coming from more than 1 million galaxies in the same patch of sky in order to get a better idea of what is going on in and around galaxies and how they have evolved over time. Kartaltepe, who has been involved in the collaboration since she was a graduate student at the University of Hawai'i at Manoa, said she was honored to help lead the collaboration toward its next step. The COSMOS collaboration initially centered on observations from the Hubble Space Telescope but has grown in scope to include many different types of telescopes. In the near future, COSMOS scientists will be focusing much of their work on observations from the James Webb Space Telescope, the Atacama Large Millimeter/submillimeter Array (ALMA) in Chile and the Karl G. Jansky Very Large Array in New Mexico. Kartaltepe will co-lead the collaboration along with two other new heads: Caitlin Casey of the University of Texas at Austin and Vernesa Smolcic from the University of Zagreb. The leadership team focuses on writing new proposals and getting funding for the project, organizing annual collaboration meetings, coordinating papers being written by the collaboration and looking forward to the future.